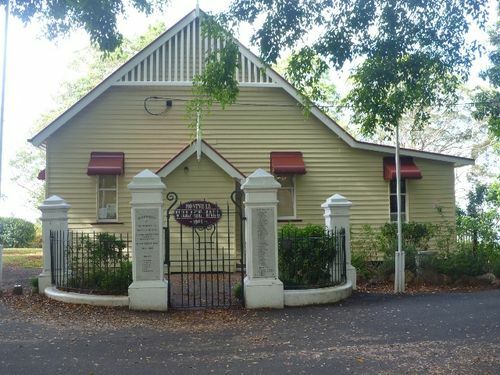 The gates to the Montville Village Hall commemorate those who served in World War One, and those who attempted to enlist in the Australian Imperial Force but were rejected. The Memorial Gates were unveiled on Armistice Day (11th November) 1921, by the Chairman of the Maroochy Shire, Mr W.H.Harvey in the absence of Mr H.F. Walker M.L.A. After the unveiling ceremony schoolchildren sang "God Save the King" to the hearty cheers of the assembly. Each school child had a bag of lollies, an apple and a cake handed to them. Chronicle and North Coast Advertiser (Qld), 18th November 1921. These Memorial Gates were unveiled on 11th November 1921. The pillars are made of Helidon sandstone. They were purchased by the people of Montville and built by Mr W. Scott for Andrew Petrie, stonemason. This memorial is unusual in that Rejects are listed - those who enlisted but for varying reasons were not accepted.